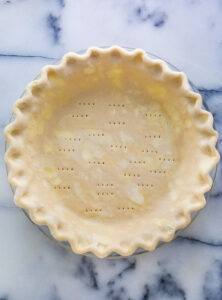 This Foolproof All Butter Pie Crust is the ONLY pie crust recipe you’ll ever need! Perfect for all of your pie baking needs. In a spouted glass measuring cup combine the water and apple cider vinegar; place in the freezer until needed (this will get it ice cold). In a large bowl combine the flour, cornstarch, salt, and sugar; whisk well to combine. Add the cold butter cubes and toss them in the flour, making sure each piece gets coated. Using a pastry cutter or bench scraper, cut the flour and butter together until the pieces of butter are the size of peas. Slowly add in the cold water and cut it into the mixture until there are just a few bits of loose flour left. If the dough is too dry and doesn't hold together when pinched, add in cold water, one teaspoon at a time, until the dough comes together. Be sure not too add to much liquid here! Gather the dough together and carefully pour it out onto a lightly floured work surface. Gently knead the dough into a shaggy ball, about 4 or 5 kneads should do it. Scrape up the dough and form it into a disk. Wrap the dough in plastic wrap and refrigerate for at least 1 hour before use. Remove the dough from the fridge 10 minutes before you begin rolling, as dough that is too cold will crack. Lightly flour a rolling pin and your work surface. Set the dough in the middle of the work surface and - beginning from the center of the disc - roll the dough away from you in one firm and even stoke. After each stroke, rotate the disc a quarter turn clockwise and roll again. Lightly sprinkle more flour on the work surface, on the dough, and on the rolling pin as needed. You want to use just enough to prevent the dough from sticking. As your disc of dough becomes larger, be sure not to overstretch the center of the dough. Continue rolling until the dough is 3 inches longer than the pan you are using, and around 1/8" to a 1/4" in thickness. Carefully fold the dough in half and lay it across one side of a buttered pie pan, placing the seam of the dough in the center of the pan. Gently unfold the crust, then use your hands to fit the dough down into the pan, making sure there are no gaps between the dough and the pan. Burst any air bubbles with a fork. Do not pull or stretch the dough here! Using kitchen sheers, trim the dough overhang to 1 and 1/2 inches, measuring from the inner rim of the pan. If making a single crust pie, roll and pinch the excess dough overhang under so that it fits directly on top of the pan's rim. Be sure to pinch and roll it tightly here, otherwise it could unroll while baking. Next, flute (or crimp) the pie crust. The best way to do this is to use the index finger and thumb of one hand to form a letter C that the thumb of your other hand fits into. Crimp the edges all the way around the pie, being sure the final crimped crust sits directly on the rim of the pan. Cover the crust with plastic wrap and refrigerate for at least 1 hour, or up to 48 hours. You may also freeze for up to 2 months. For baking, follow the instructions of the recipe you're using, as all pies are baked differently.